Debora Stewart was born in Iowa in 1951. She has lived in Clinton, Iowa all of her life. She received a Bachelors in Art Education from the University of Iowa and a Masters in Counselor Education from Western Illinois University. She has always maintained a dedicated and active creative life even though she has held other career positions. She has worked with the developmentally disabled, substance abuse treatment and prevention, school counseling and art education. In 2000, she authored a curriculum titled Creating Choices: A Creative Prevention Program for Youth. She has presented at numerous conferences on the use of creativity to build resiliency in youth. Ms. Stewart is currently employed as a middle school counselor and art educator. She exhibits regionally and has sold her pastels nationally. She is currently represented by Iowa Artisans Gallery in Iowa City and Quad City Arts Center in Rock Island, Illinois. 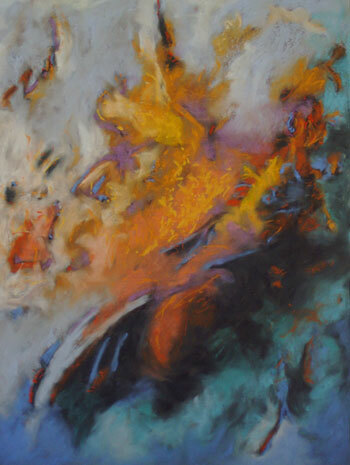 About her work, Deb writes, "Creative expression has always been my form of meditation. My art is always in transition. It grows and changes. It evolves from one form to another. I have experimented with many mediums but I always seem to go back to my "roots". I have a love of drawing. I enjoy the immediacy of drawing and the feel of charcoal and pastel on paper. My work contains several layers. I often start with a charcoal drawing and blend soft pastels over the top. This creates a velvety richness of textures and colors. Touching and manipulating the drawing is important to me. I strive to create an emotional connection through the intuitive and expressionistic use of colors. My goal is to immerse myself and the viewer in the image and utilize art as a spiritual experience."